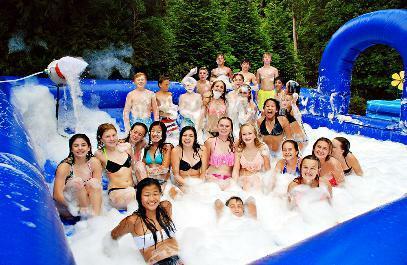 Our Foam party rental is the biggest in the area and produces foam faster than any around. Outside dimensions are a true 30 feet by 30 feet, not an exaggerated number like some. We supply the best top of line foam fluid that is no toxic and non allergenic. Safe for all ages and will not harm grass or plants. Give us a call about the biggest foam party inflatable in Winter Haven, Lakeland, Auburndale and all Central Florida locations. This fun party rental requires 2 - 120 volt receptacles (plugs in wall) and is fun for all ages. Included in rental is our 30x30 foam pit inflatable, 1 gallon of foam concentrate which lasts approximately 3 hours. Need extra foam concentrate for a longer event? 1/2 gallon is $50.00 and makes another 50 gallons of foam juice which last another 1 hour before it dissolves.